Go back 39 years, to when an ageing but still brilliant (in and out of the ring) Muhammad Ali fought Leon Spinks is a return bout, and the word record was set for biggest indoor attendance for a boxing match. Ali-Spinks II, the fight that saw “The Greatest” make history as the only man to have won the world heavyweight crown three times, took place at The Superdome in New Orleans and an incredible 63,315 fans paid to attend. But next month’s Anthony Joshua-Kubrat Pulev fight is on target to smash that record. 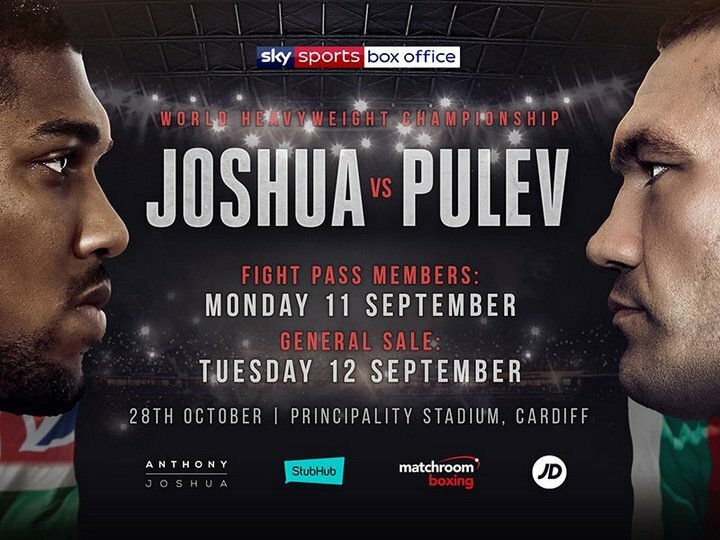 According to a piece in The London Standard, promoter Eddie Hearn is expecting a crowd of around 80,000 to attend the October 28 fight that will take place at The Principality Stadium in Cardiff, Wales. It really is quite something to see how popular Joshua is today. And in terms of KO action, next month’s fight should top the Ali-Spinks rematch; which left those fans watching happy enough seeing how their hero won, but the fight was no classic. 39 years ago this week (September 15) Spinks, always a fun-loving character who was never too fond of training, entered the Ali return having done as much partying as could be imagined after shocking the world and becoming the first man to take the crown from Ali in the ring. Ali, shamed by the loss, just the third of his storied career, pushed his body harder than he had in many a year, whipping himself into shape as he knew he had to get his title back. Spinks’ head was everywhere but the ring that night almost 40 years ago, and his corner, which featured the great George Benton, was helpless in guiding him. Despite the turmoil, Spinks, 7-0-1, managed to win a few rounds against the 55-3 Ali. With no punch power to call his own at this advanced stage in his at times brutally punishing career (Ali, who had experienced “near death” in Manila against Joe Frazier three years earlier, should have been happily retired by the time he had allowed a raw novice to pound away at his failing body) Ali had to stay on his toes and pick up points to get the win. Spinks was in no shape to stop Ali from apparently turning back the clock (when in fact the clock had stopped ticking a while back) and, at his lowest weight in years, making history. Ali bounced, danced and at times punched his was to becoming a three-time heavyweight king. Ali won, for the last time in his life, but, as he told the brilliant Mark Kram when speaking in utmost honesty in the mid-1980s, we “never saw anything” that night in ‘Orleans. Ali got revenge for a loss he should never have suffered in the first place. And this should have been the end for Ali and for a time (two years) it was; only for the tragic decision the finest heavyweight in history made when he came back not once, but twice – losing, badly, to Larry Holmes and then Trevor Berbick. Spinks? He fought on, sort of, for a staggering 17-years and 37 fights. Ali quit with what he had left, as well as a 56-5 record, in 1981. Spinks took what he had left, whilst sporting a final 26-17-3 ledger, in 1995. Next boxing news: It’s Fight Week! GGG – Canelo just days away!